Atlanta-based women’s equality group, Atlanta Women for Equality (AWE), is turning a global spotlight on the pay disparity between black women and white men at 2:07 EST today. Participants are asked to take ‘selfies’ holding the printable time card graphic available on AWE’s website. 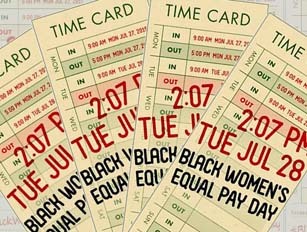 The goal of the pictures is to show thousands of women and men symbolically clocking out of work at 2:07 p.m. That’s the time that is 64% into a regular 9-5 workday, which is the time the average black woman would leave work to account for the wage gap if she were paid at the same hourly rate as the average white man. Participants will post pictures on Facebook, Twitter, Instagram, Pinterest, and other social media platforms using the hashtags #ClockOut4EqualPay and #BlackWomenEqualPay. “We’ve been getting tremendous responses from around the world,â€ Lisa Anderson, executive director of AWE, told BlackEnterprise.com. “The message is simple. You can’t keep paying black women less than what you pay white men, simply because they are black women. It’s against the law, and part of our goal today is to make sure that people understand their rights,â€ Anderson added. According to the National Women’s Law Center, African American women earn 64 cents for every dollar paid to white men.